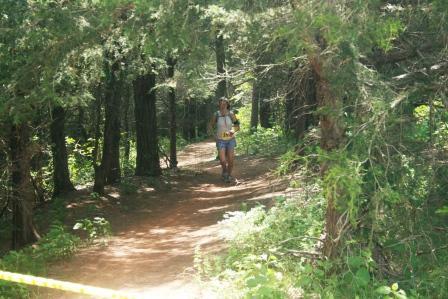 Actually, it was called the Trail Nut Half Marathon. This wasn't the greatest race for me. 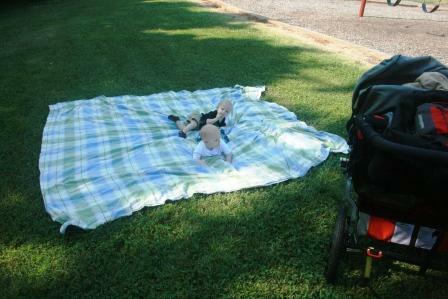 It started at 9 am, which was a late start considering the heat. 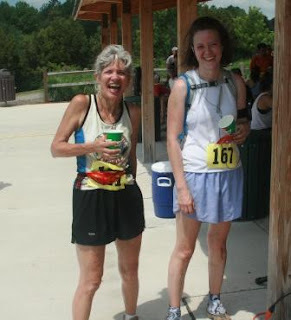 I don't typically carry water during races, but with water stops only every 3+ miles I knew I'd need it today - temps would hit 90* by the finish. Course I'm too fat for my fuel belt (stupid postpartum belly that will.not.go.away) so I had to opt for my Camelbak. I filled it with 40 ounces of water and a bunch of ice. That's a lot of water, but it really didn't seem heavy to me. 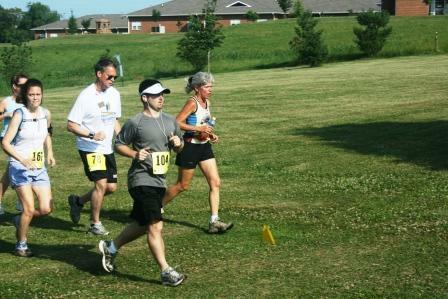 Here's a pic from about 1/4 mile into the race. I'm on the far left, with a look on my face that expresses my thoughts, "It's hot!" Meanwhile, Cort and Reid enjoyed crawling on a blanket in the shade while Pierce hit the playground. Ahhhhh. Must've been nice. The first loop of the course went okay, even though I was slow. I walked some of the hills, which I pretty much never do, but it was HOT! There was virtually no breeze - I think I felt a breeze twice during the run, and then for only a couple of seconds. Every time I took a sip of ice cold water from my Camelbak, though, I felt slightly revived. 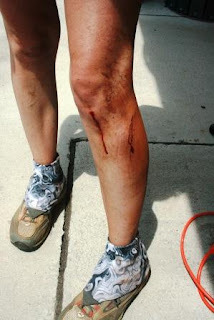 My legs were tired in spite of 2 days off from running. Not sure what was going on there. At the halfway point, we had to run by the finish line, and I was tempted to call it a 10K and quit, but I knew I would've beaten myself up for the next year if I'd done something that wimpy. Here I am, just past halfway. During the second loop I started tripping frequently. I was just worn out from the heat, and didn't have the greatest foot placement. I think I was also draggging my feet some. I ended up falling twice! Unheard of! I sure was glad when I crossed the finish line. Sadly, I ran a new personal worst by THIRTY minutes. Yeah, the conditions were awful, it was hilly, it was trails, and the course was long (about 13.25) and so forth and so on. But honestly, I never would've thought I could've run a half that slow. I really need to start evaluating what I'm putting in to my runs more, and trying to get things together a little better. Below is me with Trina, so happy to have survived. 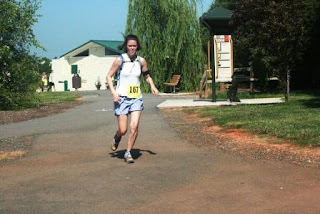 Trina runs a lot of trail races, and she said it was the worst race she'd ever run...just because of the heat. She also said, "Look at it this way, next year if you do this again you're guaranteed an instant PR on this course". I like having positive friends! Seriously, 90* is pretty dang gnarly. The race was well organized and I love my new t-shirt which says I heart MUD and I'm a Trail Nut. If I run this again, I think I'll wait to see the weather forecast before I sign up though. Do you think you should have your B12 levels checked? sheesh woman. you are not fat. also. i plan on running my first 1/2 in february. at disney. meet me there. do not wear your camelback... because you'll be carrying me from mile 2 and on. also. congrats! and sorry you fell. Glad you finished in that heat! Hope the next half is cooler! Well????? Did you get "best blood"? Good LORD, woman! You are amazing! I am bowing down to you here, after eating my Chinese food for dinner and swelling up like a balloon. YOU ROCK!! !